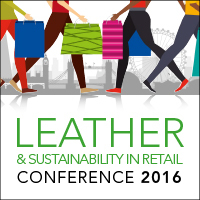 Following the success of last year’s conference, BLC Leather Technology Centre Ltd and International Leather Maker (ILM) are pleased to announce the date of this year’s half-day conference which will be held on Thursday, November 17, 2016 at the prestigious and newly built, Leathersellers’ Livery Hall in the City of London. With environmental sustainability still at the heart of any successful business, the theme of this year’s conference will again be focused on building a sustainable value chain for the leather industry. A key requirement for all retailers and brands is upstream supply chain transparency. We have put together an exciting line-up of international industry leading specialists, including major brands and/or retailers, tanners, leather supply chain suppliers (machinery/chemicals) and organisations representing the most up-to-date developments across a range of topical subjects. 12.30: Animal welfare best practice & global challenges. 13.40: Sustainability: Core value or marketability? 14.20: Sustainability strategy with a focus on chemical management: A positive example of supply chain collaboration. 15.00 – 15.30: Coffee break/networking session. 15.30: Advances in technology for reducing the environmental footprint of each step in the leather manufacturing process. 16.10: Why traceability is imperative. 16.50: DNA labelling - The smart way to follow materials through the supply chain. 17.30: Conference wrap-up and close. Conference: 12.30 – 5.35pm (30 min coffee/networking break). Cost: The price to attend the conference (per delegate) is £295 / €415 plus any applicable taxes and fees.